The year 1924 was a great one for perfume, if only because it saw the launch of both Chanel’s sumptuous Cuir de Russie and this, the wonderful Knize Ten. That both have survived into the present day is a bit of a miracle, but though they’re both usually placed in the ‘leather’ category of fragrances, they could hardly be less similar. Cuir de Russie is a wonderfully rich and complex perfume, but its oddly androgynous combination of smoke and leather with a heavy floral note can make it rather difficult to wear. Knize Ten is a much more immediately appealing, fresher-smelling scent, and its leatheriness is tempered with the kind of zesty and herbal ingredients you’d expect to find in a classic eau-de-cologne – things like bergamot, lemon and geranium. These gradually fade away on the skin, leaving a lovely, long-lasting but not overpowering leathery scent, less smoky than it is sweet. To me it also has a strong whiff of heliotrope – those electric-blue park bedding plants whose cherry-pie scent can be so intoxicating on a hot still high-summer’s day – but others may detect more than a hint (if I remember it right) of Plasticine; not unpleasant in itself, but enough to add a touch of childhood to the mix. If Cuir de Russie is a testament to the genius of Ernest Beaux (whose greatest triumph was Chanel No 5), then Knize Ten is a fitting monument to François Coty (the mass-market perfume pioneer) and his brilliant technical director, Vincent Roubert (who had previously worked with Ernest Beaux in Grasse, then the perfume capital of France). It was commissioned, rather unusually, by a bespoke men’s tailoring company from Vienna, Knize, whose boutique is still going strong today. I’d wondered whether Knize Ten was the sole survivor of nine other fragrances, but it turns out that the name was dreamed up by their advertising director of the time, who beat Ralph Lauren by at least 50 years by seeking to associate the company with the aristocratic imagery of polo: the name ‘Ten’ was chosen to reflect the highest handicap in the game. 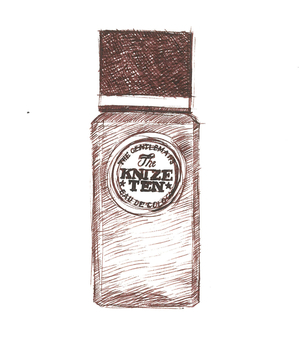 I love everything about Knize Ten: not just its instantly appealing smell but the smart glass bottle, with its crisply bevelled corners and chunky black cube of a cap. I’ve read somewhere that, like the company’s Viennese store, it was designed by the legendary Austrian architect Adolf Loos, and although that seems like wishful thinking it could be true; Loos designed further shops for Knize in Paris and Berlin, so their association was obviously close, and the dates look perfectly plausible too. Even the typography of the label – a bold slab serif in a Victorian playbill style – is punchy and confident, just like the perfume inside. And while it’s far less widely available than it deserves to be, it’s not even that expensive by contemporary standards: what’s not to like? Equipage is a perfume I hadn’t smelled for years. I had a bottle long ago, but when it ran out I never got round to replacing it. Actually I’d forgotten how good it smells, so I’m delighted to have it back. It’s as timeless and well made as a piece of Hermès saddlery, and it even has something of the same comforting, leathery smell. 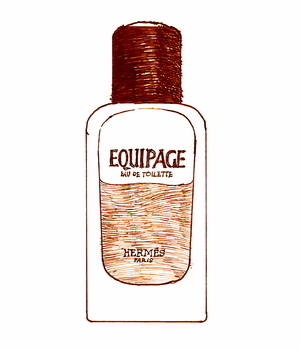 The first Hermès perfume to be aimed at men, Equipage was created by Guy Robert, one of the leading perfumers of his generation. You could say that Robert had perfume in his blood. He learned his trade in Grasse, once the world capital of perfumery and still an important production centre today. His uncle, Henri Robert, succeeded Ernest Beaux as perfumer-in-chief at Chanel, where he created No.19 and Pour Monsieur. Equipage shares much of its character with Pour Monsieur, smelling effortlessly grown-up, discreet and rather conservative. The funniest comment I’ve seen online is that it ‘makes you smell ten years older. Richer, maybe; but older’, and I think that’s right, but now I’m older myself it’s nice to at least smell rich. For a men’s perfume it has rather more floral ingredients than one might expect, including lily of the valley, jasmine and carnation, but they’re so subtly blended together that you’d never know. The flowers give it a little sweetness, but that’s balanced by the spicy, clove-scented edge of carnation. Equipage also contains a lot of orange, in the form of bergamot, squeezed from the peel of the Sicilian bergamot orange, Citrus bergamia, which is also used to flavour Earl Grey tea. But that’s not all. This rich and complex fragrance also includes oakmoss (or a synthetic equivalent), which is actually a type of lichen that smells like a forest after rain; as it happens oakmoss also features in Pour Monsieur and Chanel No19. You might also be able to smell a touch of patchouli, that favourite 1970s fragrance, and perhaps a little Badedas-like pine – another forest touch. There’s much, much more, which makes Equipage worth returning to again and again. It may not be the most avant-garde of fragrances, but if you want something reassuringly luxurious, it’s up there with the best.